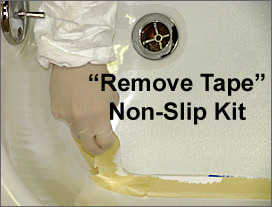 Anti Slip Coating provides a slip-resistant surface to bathtub bottoms, shower bases, tile or concrete floors. Designed for applications where a patch area or a defined non-slip/anti-slip surface area is required to save completely refinishing the entire surface. Obviously, no surface treatment can totally prevent falls. However, this will help keep your employees and loved ones safe on all of these surfaces. Our Anti-Slip Coatings will increase friction and reduce the likelihood of a fall. The components include either a clear coat or a color-matched coating with a semi-transparent powder added to provide a textured surface. The Quick Glaze system provides a great textured surface for porcelain, cast iron, gelcoat and acrylic bath products as well as tile, concrete or metal surface. If the following procedure is followed, it will have great adhesion to the existing surface. The final surface appearance should have a consistent textured surface as shown in the picture. The photos and instructions displayed below will show you exactly how simple it is to do your own repairs in just 5 easy steps. For additional instructions click here. Also, we recommend purchasing our accessories by clicking on the products listed below. Tape off desired area for the non slip coating treatment. Sand surface with 220 or 320 wet sand paper until dull to assure proper adhesion. Shake base well. Mix four (8) parts base to one (1) part hardener. One hour working time; depending on temperature. Apply moderate coat(s) with enamel type paint roller until desired coverage consistency and texture is achieved. Remove tape and allow 12 to 24 hours to cure. Please see finished product below. Anti Slip Coatings for Tiles - Can be used as a non skid product for porecelin, enamel or tile surfaces. Non Slip Concrete - This product works effectively on concrete floors as well. Non Slip Metal Flooring - Works effectively on metal surfaces for safety. 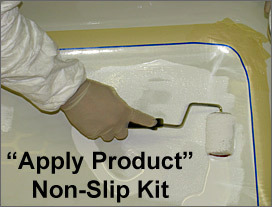 Non Slip Bath - This Anti Slip Coating was designed specifically to work on gelcoat and acryltic bath products. I have recently used this product and I must say it works great. Colour matching, ease of application and the results, all as advertised and better. I would definitely recommend this product. Now, let's see how long it lasts. I wanted to wait for a few weeks to see if I liked this product. I can only say that it is probably the best bathtub surface material I've ever used. Sure beats a tub mat and it was VERY easy to apply as long as you follow the instructions. I would buy it again in a heartbeat. this antislip coating work wonders on my bathtub. The grit is very easy on your feet and its enough to where you wont slip. Just make sure to sand the tub with 320 grit sand paper and it'll stick great. Ive never had any issues with this company and products always arrived on time. They sent email to review - Still have not recieved product../. Dear un-named review... We checked in our system. 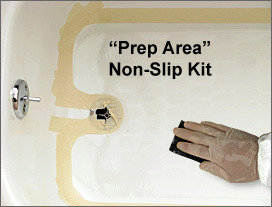 There has not been any misrouted or shipment mishaps on any recent Non-Slip kits. Our product ships promptly as tracking numbers are included. Although our customer service has not received a phone call or an email about your case. Please contact our customer service as soon as possible to resolve any issues or confusion. 800-218-2066 We will be happy to help you. My wife slipped and broke her tail bone in our cast iron porcelain coated tub. I knew it was slippery and we had tried bath mats but ended up throwing them out because they quickly became nasty. I researched many products on line and settled on the bathtub and shower texture coating. I was nervous at first but followed the instructions to the tee. My only mistake was not using the thinner initially and poured half the mixture on the tub and realized it was too thick to spread evenly. I mixed some of the thinner with the remaining half and poured it on the tub surface. It spread out evenly and looks great. Most importantly, it is perfectly textured. My wife is now comfortable getting back in the shower. Although textured applications can increase surface grip significantly. Other things can increase the chance of a fall. Beware of hair and body products that make the surface slick, even with texture. For example, hair conditioner and certain soaps can diminish the grip of the original surface without texture. Consider avoiding those toiletry products that make critical surfaces slick. Bought the K1000 kit and was very pleased with the results. Followed the taping procedure and mixed the "goop" and all went well. Would have given 5 stars but the mixing directions for the hardener were a little smeared. I ended up just dumping the hardener into the coating and going from there. This product has great durability and was very satisfied with the outcome. The reducer bottle that it comes with is optional to use. Make sure to prep with with 220 grit, and when pulling up tape it may pull up the edges a little so i went back over the edges with a little paint brush to seal the edges, worked great. I also had a lot of spider cracks and started to get chips. The crack and filler polyester filler worked awesome and is easy to sand. If you have any questions speak to Rick and he was very helpful . The individual containers of product have quantities on the labels. 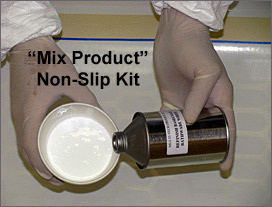 (looks as there is way more anti-slip powder than req'd for accurate proportion mixing of 32-1) Guess they want you to have more for adjusting??? There should be an estimated time frame for masking removal without damage to the product edge lines. K2000 and Quick Glaze applications, allow to dry for at least 20 minutes before removing tape. Tape will come off smooth when product does not overlap the tape heavy or over-loaded. Tape can come off anytime up to 24 hours. 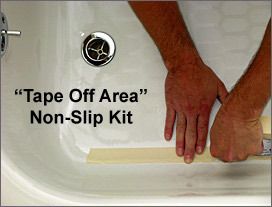 In the event of flooded or overloaded product, or If longer periods have passed, cut or follow the tape line with a knife or razor. Tape will peel off smooth. EXCELLENT PRODUCT. Works exactly as advertised. Our tub was extremely slippery : now it is safe again. This repair kit is easy to use and provides the installer with everything needed. Thank you. Click the button below to add the Bath Tub Shower Anti Slip Coating to your wish list.